When Microsoft launched its Office Web Apps back in June, the most logical reaction was a simple, “What took you so long?” Competitors such as Google Docs and Zoho proved long ago that it’s possible to host free Office-like programs on the Internet and deliver them to any Web browser—for free. They’ve improved over the years, gaining more and more fans along the way. Microsoft may have finally joined the Web-office game, but in many ways it’s still playing catch-up. The Office Web Apps are radically less powerful than their counterparts for OS X and Windows; given how mature Office’s traditional-software versions are, that’s no shocker. But the Office Web Apps are also much skimpier than Google Docs and Zoho, both of which come closer to replicating most of Office’s mainstay features. The Office Web Apps might be worth checking out if you find yourself temporarily using a computer without Office 2011 and need to take a peek at a document or do some very light editing. But if your needs are more than rudimentary and you thought the Office Web Apps would let you use Office without plunking down money for Office 2011, forget it. Word Web App: Word has a decent clip-art browser. But standard word-processing tools such as Find/Replace are unavailable. The consumer versions of the Office Web Apps are part of Microsoft’s Windows Live service, which means you’ll need a Windows Live ID to use them, and you’ll be exposed to a few ads. (The only ads in the Web Apps themselves are one-line text promos for Office’s desktop version.) 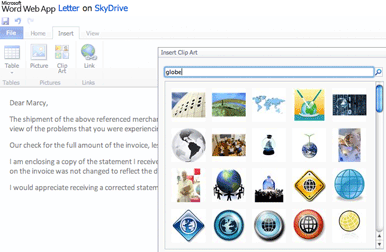 You store documents using Windows Live’s SkyDrive online-storage service, which gives you 25GB of free space. And if you happen to be a user of the recently improved Hotmail, well-done integration lets you open file attachments in Microsoft’s file formats in the appropriate Web apps, no downloading required. Businesses, incidentally, can roll out separate versions of the Web Apps that are built to work with the SharePoint collaboration system rather than with SkyDrive. As you’d expect, the Office Web Apps include browser-based editions of Word, Excel, and PowerPoint. You also get a Web version of the OneNote note-taking program, a member of Microsoft’s Office for Windows suite that’s never been available for OS X. (There’s an Outlook Web App, too, but it’s not available to consumers—it’s a service that companies using Microsoft’s Exchange e-mail server can provide to its employees.) I tried the apps in Safari ( ), Firefox ( ), and Chrome ( ) for OS X, and everything worked as expected in all three browsers, with one exception: Buttons for launching the Office for Mac 2011 programs from their Web Apps counterparts were inoperative in Chrome. Excel Web App: Nicely-done charting features (added in a recent update) are a highpoint of the Excel Web App. Certain aspects of Microsoft’s online suite are impressive. It certainly looks good, with an interface built around the streamlined Ribbon toolbar that makes its Mac debut in Office 2011. It’s not same Ribbon you’ll find in Office 2011 or in Office 2010 for Windows, though—featurewise, the Web Apps are so minimalist that they have only three or four sparsely-populate tabs apiece. The interfaces also have a snappy, responsive feel. Microsoft has done an admirable job of supporting the XML-based Office file formats used in all versions of the suite since Office 2007 for Windows. If you’re using the Web Apps’ “Reading” modes, which let you view files but not edit them, even richly-formatted documents look just about perfect. If you switch to edit mode, some fancy formatting disappears, such as multiple columns in Word, but it’s still in the file, as you’ll see if you make changes and then open the document in Office 2011. Google Docs and Zoho do a decent job with most Office files, but they’re more likely to have display issues or mess things up when you make edits. One major, annoying file-handling caveat: If a Word document includes edits made in revision-tracking mode, you can’t open it for editing at all in the Word Web App. For organizations that do a lot of collaboration on Word documents, that might be a show-stopping limitation. 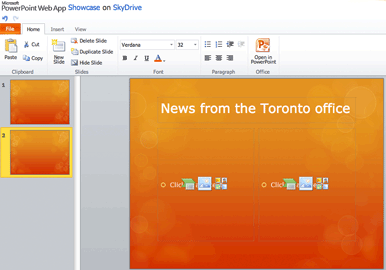 PowerPoint Web App: Some polished templates are included, but they’re inflexible. You must place graphics in fixed blocks. It’s not the lack of sophisticated collaboration features in the Web Apps that’s most surprising, though. It’s all the basic productivity features that are missing in action, ones that are standard equipment in every other product that calls itself an office suite, including Web-based ones. None of the Web Apps let you save in anything except for the most recent versions of Microsoft’s Office file formats, which can be an issue if you need to share documents with folks who use non-Microsoft apps or older versions of Office. Oftentimes, it’s tough to figure out why Microsoft implemented one feature and skipped another. Despite all the basic stuff that’s missing in Word, for example, it does sport a well-done tool for creating and editing tables. And PowerPoint doesn’t let you draw a simple square or circle, but does offer SmartArt, which lets you create slick org charts and other diagrams. OneNote Web App: A mainstay of Office for Windows, the OneNote Web App lets multiple people edit a notebook at once. The approach to file management is also confusing. File menus are in the Web Apps, but they don’t let you open documents or create new ones; instead, you use a clumsy and sluggish external area of your Windows Live account. If you’re in a spreadsheet or word-processing document and want to open another one, you exit the Web App first, then come back in. Is there any hope for the Office Web Apps? Sure—they may be Spartan, but by providing pleasantly Office-like interfaces and (mostly) solid support for Office file formats, Microsoft has already nailed a couple of important fundamentals. If it beefs up the Web Apps at anything like the pace that Google and Zoho improve its suites, Web Apps could get much more appealing very quickly. Already, there’s reason for cautious optimism. 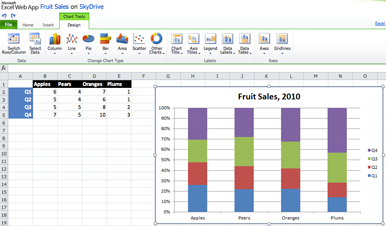 Since the Office Web Apps went online, Microsoft has filled in some of the holes, adding printing capabilities to Word and giving Excel respectable charting features. It also added the ability to embed PowerPoint slideshows and Excel worksheets in blogs and other sites, an option that Google Docs has already. For now, I believe most people who are serious about online office suites will be better off with the ones from Google and Zoho. I’m keeping my eye on Microsoft’s Web Apps, though—it would be strange and disappointing if the world’s dominant office-suite company proved incapable of producing a competitive online suite.